Arsenal made it nine wins from nine (six in a row in the Premier League) with a 5-1 win over Fulham at Craven Cottage yesterday. It was by some distance our best performance of the season from back to front, and perhaps a day we might look back on as when things really started to click for Unai Emery’s team. Without Mesut Ozil because of a back spasm, the boss left Pierre-Emerick Aubameyang and Aaron Ramsey on the bench, staring Henrikh Mkhitaryan, Alex Iwobi and Danny Welbeck in what was essentially a 4-4-2. Welbeck had licence to drift while Alexandre Lacazette stayed more central, and we had Bernd Leno to thank early on for making a very good save from a shot which took a deflection on the way through to him. The German is doing his utmost to give Emery a headache when Petr Cech is fit again. We moved the ball well down the channels, the left hand side in particular was an area we had a lot of success against Fulham’s back three and it was no surprise this was the area from which the first goal came. It involved Iwobi, Monreal overlapping, and a superb touch, turn and finish from Lacazette who found the bottom corner beautifully. The one blot on our copybook was the Fulham equaliser just before half-time, a reminder that carelessness can cost you in the Premier League, and Schurrle took advantage to dink the ball over Leno. For some people it’s the worst time to concede, damaging the confidence after what was a good first 45 minutes overall, but this Arsenal are a good second half Arsenal, and came out of the blocks flying. After Hector Bellerin had forced Marcus Bettinelli into an excellent save, Welbeck won a flick on and Lacazette’s first time effort flew into the bottom corner. I was surprised the TV folks were having a go at the keeper to be honest. He was caught out a bit by how early the Arsenal man hit it, but also the precision, and it was a long way from a goalkeeping howler. I think our man deserves far more credit than Bettinelli does criticism. Emery made changes, bringing on Aubameyang for Welbeck and then Ramsey for Iwobi, and within a minute of being on the pitch the Welshman scored what I’m sure is going to be goal of the season. If there’s a better team goal between now and May then I will doff my cap to it because this was something special. I’m sitting here this morning thinking about how to talk about it. Just saying what happened seems almost sacrilegious but Ramsey’s involvement in it from deep in our half to the sublime flicked finish inside their box is incredible, as are some of the touches along the way. His little clip over the Fulham player to play it to Lacazette who volleys it forward to Bellerin who catches it with a back-heeled volley into the path of Ramsey, the two headers, Mkhitaryan’s perfect pass to Aubameyang and then the ingenuity of the finish … I’m clearly not doing it justice. I don’t think words can. You need your eyes. Just watch it. And watch it again. And again. Because it stands up to repeated viewing. There’s just so much to like about it, and Unai Emery’s delighted reaction on the touchline adds a little icing to the cake as well. It’s one of the best goals you’ll see all season, anywhere, and it’s a reminder after a difficult few weeks of what Ramsey can bring to this team. The contract situation led many to suggest leaving him out altogether, but it really is like cutting off your nose to spite your face. Whatever happens between now and January, or now and May, he can be a real asset to us, and I was glad he made the impact he did. He wasn’t the only sub to make his mark though. Aubameyang got our fourth after a smart turn and finish from a Bellerin cross, and after patient passing from the back and keeping possession in tight areas a couple of times, Xhaka found Ramsey whose pass through to the striker saw him showcase his considerable pace and finishing ability to make it 5-1 in second half injury time. Between them the two substitutes plundered three goals and two assists, and it was no less than we deserved on the day. It was the kind of performance that felt like a bit of a step forward. We weren’t perfect at the back but we were definitely better, not allowing Fulham the same number of scoring opportunities we’ve given other teams this season, and any day when you score five goals away from home is a good day. The fact we’re spreading the goals around the way we are is another big positive too, and in the context of the game itself the way we dealt with the early kick off away from home after a Thursday trip to farthest reaches of Europe is something else to be happy about. When you look at the league table it’s hard not to be impressed by the way we’ve responded to what was a really difficult start to the season. We’re in the top four, ahead of Sp*rs on goal difference, and with 18 points we’re only two points behind the leaders as Man City, Chelsea and Liverpool all sit on 20 points. We’ve heard it said more than once that we’re a work in progress, and yesterday was very evidence of some progress. It’s a bit of a shame we’re now going into an Interlull but we can’t use that as an excuse if our momentum slows. At some point we’re going to have to deal with a setback or a bad result or two, so how we cope with that will be interesting. 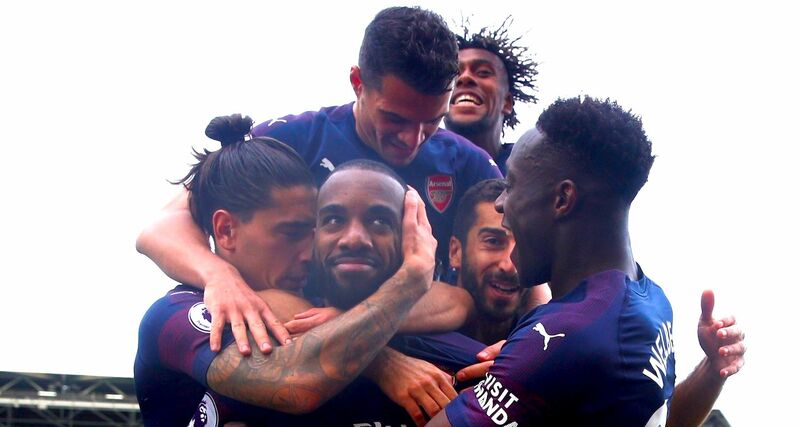 I hope there’s enough goodwill in the tank for people not to go ballistic over it, but right now we’re winning games and yesterday was the most enjoyable performance I’ve seen from Arsenal for a long time. That should have folks in a good mood this morning, and there’s just no need to add any caveats to what we saw yesterday. Four very good goals, one absolutely special goal, an away win, and a team and a group of players that look like they’re moving in the right direction and enjoying their work. More please, it’s delicious. Right, I’ll leave it there this morning, but for more there’s a brand new Arsecast Extra recorded last night. It was fun to do, hopefully you’ll have fun listening. Links to listen/subscribe are below, and if you like the podcast, please give us a rating/review on iTunes if you haven’t already. Till tomorrow!